How to buy from Amazon in Pakistan and India and is there any Custom and tax on it? Amazon Ship to Pakistan ? Can I buy from amazon.com in Pakistan or any country where amazon don’t have the regional website like amazon.uk? amazon ship to Pakistan? This is the question for which I have spent a lot of time and in the end I got the answer that “yes you can buy directly from amazon.com or amazon.uk etc” & I am sharing here the personal story. There might be indirect shipping companies or most of people ship stuff to family or friends in US and have them bring it over if they are visiting soon. But I this article I will show you that how you can buy directly from amazon. Most of the Pakistani people have view that amazon is shipping only books from Pakistan or on Pakistani address or Amazon Ship to Pakistan only books but this concept is also wrong. Amazon is shipping every type of products like electronics, computers, cellphones, clothing etc. to Pakistan. If you browse amazon website you will find the amazon shipping rates and time for Pakistan. Most of sellers on amazon are not shipping for Pakistan, but there are also many sellers which are shipping product from Pakistan with free shipping as well. Amazon ship to Pakistan ? Lococo (Shipping almost all types of products) I have purchase the smartwatches from amazon with this seller. These sellers Amazon Ship to Pakistan, If you want to buy from these sellers then simply type their name on amazon website search and then in result you find the every type of results in term of products from this seller in group. Click on any group and explore the product from this seller related to selected group. For example in figure if you click on “electronics: see all products” this will show you the products related to electronic. How to find more Sellers for Pakistan? Type the keyword for your favorite items in amazon search like I have typed the “cellphones” in search. 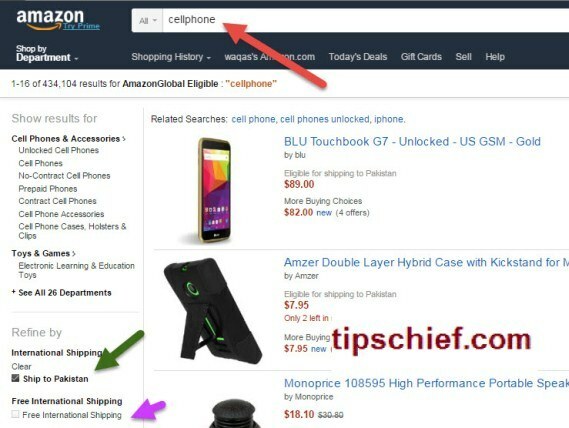 When the search results are appears, then select the option from international shipping/ “ship to Pakistan” from the left side of amazon figure as shown in figure. Now start adding multiple products from different in cart by opening every link in new tab. Once you have added 15-20 items cart, then click on proceed for check out. After select the Pakistani address you will find the products which can be deliver to Pakistan. Some of products are showing error that “Sorry, this item can’t be shipped to your selected address.Learn more. 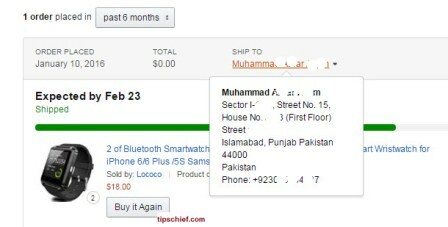 You may either change the shipping address or delete the item from your order.” But the items which are not showing this type of message are eligible for ship to Pakistan, find out the seller name of this product and then explore the more products from this seller as describe above. If you find no such items which qualify for ship to Pakistan then empty your cart and then start adding the other items from search result and then check again. Still confused, watch this video for more details..! How I have purchased smartwatch from Amazon? I live in Pakistan and i am also an Amazon purchaser. 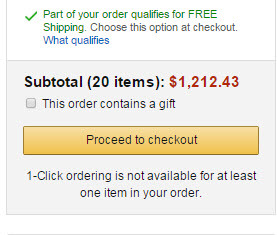 I got some Amazon money online through a amazon-gift card. But when I initially try to buy from amazon I got the same message that items cannot delivered to PK address. And then I find the different sellers which can supply different items to Pakistan. Lococo was one of them, so I put the first order of smartwatches on 10 Jan 2016. I have selected the free shipping of this product and I got my package on 31th Jan 2016. It mean it takes 21 days. If you can select the express shipping then you can get your product in less days. Is any Custom or tax apply on Products which will we import from Amazon? Please also share your experience if you have done purchasing from amazon. Thank you for your time. Another middle-man solution that solves the shipping and payment issues is Nazdeeq Customer can order from Amazon, pay in cash, and receive the item at their doorstep within 10-14 days.